Supplemental teaching materials available by emailing mak001@uark.edu. 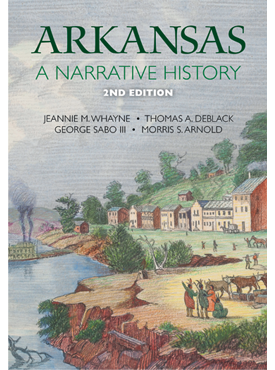 Arkansas: A Narrative History is a comprehensive history of the state that has been invaluable to students and the general public since its original publication. 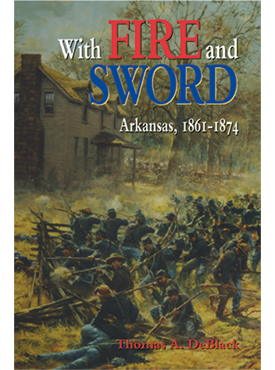 Four distinguished scholars cover prehistoric Arkansas, the colonial period, and the nineteenth and twentieth centuries and incorporate the newest historiography to bring the book up to date for 2012. A new chapter on Arkansas geography, new material on the civil rights movement and the struggle over integration, and an examination of the state’s transition from a colonial economic model to participation in the global political economy are included. Maps are also dramatically enhanced, and supplemental teaching materials are available. 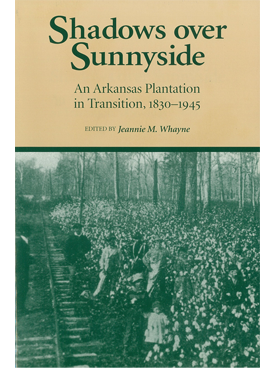 Jeannie M. Whayne is professor of history at the University of Arkansas. She is the author of Delta Empire: Lee Wilson and the Transformation of Agriculture in the New South. Thomas A. DeBlack is professor of history at Arkansas Tech University. He is the author of With Fire and Sword: Arkansas, 1861–1874. George Sabo III is professor of anthropology at the University of Arkansas. His publications include Rock Art in Arkansas and Paths of Our Children: Historic Indians of Arkansas. 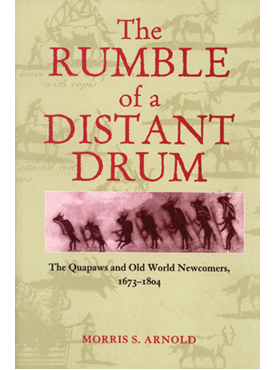 Morris S. Arnold is a jurist of the United States Court of Appeals for the Eighth Circuit and author of Rumble of a Distant Drum: The Quapaws and the Old World Newcomers, 1673–1804. Joseph Swain is assistant professor of geography at Arkansas Tech University. Ben Johnson is professor of history at Southern Arkansas University and the author Arkansas in Modern America. Course Description: Physiographic and demographic patterns; exploration, settlement, and political, social, and economic evolution of Arkansas from the Spanish and French excursions to the present. Also, a study of contemporary policies and government in Arkansas. Course Description: Focuses on selected topics central to Arkansas history, covering its political, social, cultural, geographic, and economic development from settlement to present. Course Description: An introductory course on the history of Arkansas. Lectures, discussions, and applied activities will be central to this professional education requirement for Early Childhood and Middle Level Education majors. Course Description: A study of the history of Arkansas from prehistoric times to the present, noting political, social, economic, and cultural trends.